Croquet is another summer game. I already wrote about field hockey sticks. Now consider croquet. There are many things to consider when purchasing the best croquet set. Depending on the type of gameplay you have planned, as well as the skill level and age of the players, you may need different accessories, styles, and quality of the game pieces than you originally thought you needed. 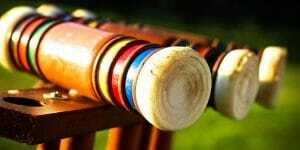 Here are a few tips on what to look for in the best croquet set 2018 and a few reviews to help you start shopping. 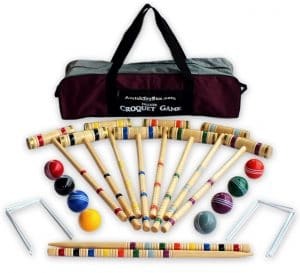 When you are looking for a fun game for your family and friends that all ages can enjoy, try a croquet set that not only gives you outdoor fun but will also help to improve motor skills. 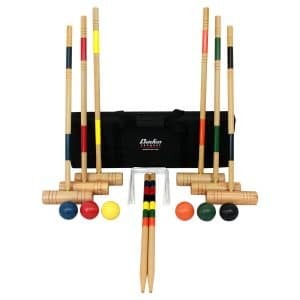 The Maggift Six Player Croquet Set is a great game for parties, picnics, and family events.The set comes equipped with six 26 inch hardwood handles and six molded balls that are weather resistant. Plus, you get nine steel wickets that include a vinyl coating. The mallet and their handles are simple to put together as the handle only needs to be screwed into the mallet which will take only a couple of seconds. 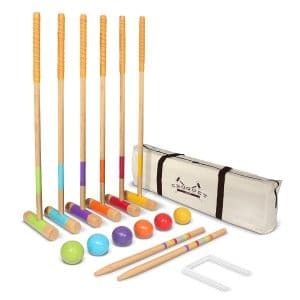 Two to six players can play with a Maggift Croquet Set. This is an easy to set up game that also comes with a carrying bag for simple transportation and storage. This is a great choice when considering a game that everyone can play at parties, picnics, and family gatherings. Customers liked how easy it was to carry, that it was lightweight, and came with a carrying case. Others liked the quality and how easy it was to set up. It is not uncommon to see Amish families out enjoying a croquet game in their yard on a leisurely Sunday afternoon. 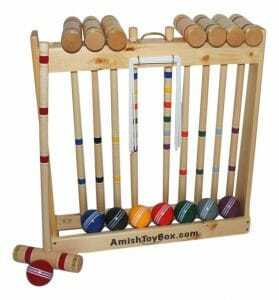 Your family can also have these same fond memories with the Amish-Crafted Deluxe 8 Player Croquet Set. This set is constructed by Amish Craftsmen right in the middle of Amish Country in Pennsylvania at Groffdale Machine Shop for incredible quality and durability. Every set comes equipped with eight Maple mallets that are not only lathe-turned but the section rings are hand painted with matching colors to the corresponding balls. On each mallet head, there are two rings made with polished brass adorn that keep the wood from breaking apart or cracking. Also, lathe-turned are the two stakes made of hardwoods that feature multicolored sections. There are nine wickets that measure 5/32″ in diameter made of metal with a vinyl-coating so they do not bend easily and are pretty substantial so they can take a beating. Made from plastic polymer, the eight balls measure 3-5/16″ in diameter. Plus, there are three different handle lengths on the mallet including standard 24-inch handles that are great for kids or smaller adults, 28-inch handles that fit the average adult, and the 32-inch handles for taller adults. Also included is a beautiful pinewood holder that includes a carrying handle making your croquet set portable and well-organized. All the stakes, balls, and mallets come with a one year warranty that will replace these items for free if they are damaged or broken within the first year. Customer loved how good the quality of the product is and the materials that were used in its construction. They also felt it was a good price considering the quality. The rack is not very stable. Summer becomes more enjoyable when you add the classic game of croquet to your backyard fun. The Baden’s Deluxe Series Croquet Set is very portable making it ideal for a leisurely afternoon game play with family and friends in the park or in the comfort of your own yard. This set comes equipped with all the pieces you need to set up a game quickly whenever you are ready to play. With the detachable croquet mallet heads, the Baden Deluxe Series Croquet Set easily packs up into its nylon carrying case but is also very easy to put together with the included connector pieces. You also get durable steel wickets that keep their shape even after being hammered into the ground. This set is designed more for backyard croquet and is also a very affordable set for casual family use. Plus it is great for camping, social events, and family picnics. Customers felt that this was a good inexpensive set that was perfect for casual play in the backyard. Not everyone was happy with the quality but felt for the price it was expected. 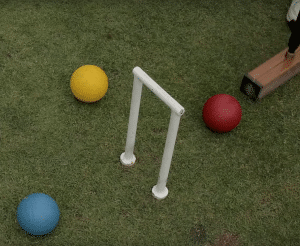 Even though many consider croquet a game of the past, some manufacturers have been updating this classic game so families and friends can once again enjoy it. The GoSports Premium Croquet Set includes a modern color scheme and design that helps them to stand out from the dates sets on the market. Both the handles and mallets are made from hardwoods to give you the most durability while the leather handles give you extra comfort. Measuring 35 inches long, the handles can be used by all ages and adults won’t’ hurt their back bending over too far. The set comes equipped with nine wickets, six balls, and six mallets as well as a set of rules and a carrying case so you can stay organized or take the game to the park. This set also comes with a 100% satisfaction guarantee. Customers like that it was made of real wood and not plastic. Others found it sturdy and appreciated the long handles and carrying case. 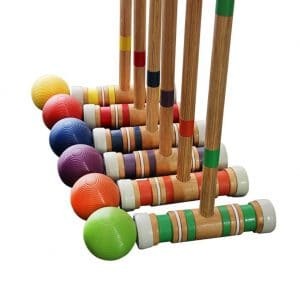 Enhance your croquet experience with the Wood Mallets 4-Player Garden Croquet Set. Perfect for beginners or seasoned players, this set provides everything you need to have a fun-filled and competitive croquet game. Using the finest materials, this handcrafted set includes four mallets measuring 36-inches long that are made from hardwood giving you an effective and accurate driving experience. With handles octagonal shaped and cylindrical shaped heads, the mallets were robust and durable enough to take on hard play. It also includes four balls made of a composite of molded plastic that included a lightly milled surface giving the set a dynamic rebound and is the perfect choice for playing croquet at home. The set also comes with 6 wickets that are powder-coated and constructed of tubular steel measuring ½ inch and a solid crossbar measuring 5/8 inch. The wickets also have a hard wearing but smooth finish. Hardwood was used to construct the center stakes which come in four colors that also include a peg that won’t be damaged when knocked to the ground. The Wood Mallets Premium Set also includes a beautiful pine box for storage that features steel latches, sturdy back hinges, metal corner plates, and rope carrying handles that have been reinforced. This elegantly appointed storage box is finely crafted and feature finger joints. The set also comes with a 28-page rule and tactics book. Customers that bought this product loved the quality of everything from the mallets to the box everything is stored in. They also felt the price was fair considering the quality of the set. One of the most important consideration when choosing a croquet set is to think about the age of the players that will be using the set. Ages will differ if an entire family will be using it so a good choice is the Lawn Croquet Set. Not only is it a lightweight set, but the hoops, balls, and mallets will weigh less than a set with full-size accessories which guarantees that both the adults and children will be able to comfortably use the set. This is also a good choice for beginners as even adults may feel more comfortable with the stable and lightweight croquet set until they gain some experience of moving around a weighted ball around for an extended period of time. Even though the Lawn Croquet set is easier physically, it still creates a game with great precision. For those that are more experienced and confident in their playing abilities. You will want to purchase a set that has mallets that weight up to 1.3kg. More advanced croquet sets will have croquet balls that weigh sixteen ounces and include high-quality structured mallets and 16oz croquet balls. 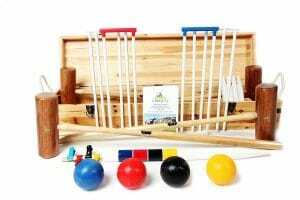 This type of set will guarantee the highest accuracy and precision and encourage fast skill development that provides for an exciting game of croquet. Depending on the set’s specific purpose, the number of mallets will vary. A mallet is a stick you hit the ball with and it features a round head that is attached to the bottom of a long stick. Depending on the stick’s length, children and short people shouldn’t have to bend over too much when hitting the ball. Taller players usually have to stoop over some when making their shots. In most cases, the mallet will not come attached, so you will probably have to screw it on and. in some sets, that is a bonus as it aids in making storing the set more compact. 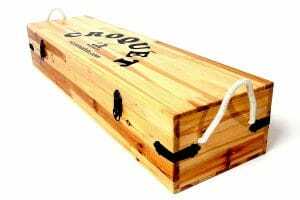 Also, consider weight when buying the best croquet set. Different materials like aluminum, fiberglass, or carbon fiber can be used when constructing a mallet or woods like tawa, hickory, or ash. Wooden mallets will obviously be heavier. They are usually suggested for older and younger players as well as beginners that don’t have as much power behind their hits. The other materials are good for more experienced players with the strength to hit the ball easily. Weight – Beginners tend to use a mallet that is too lightweight so if you are having a hard time hitting shots a long distance. You may want to consider using a heavier mallet. This is especially true if you aren’t particularly strong. The average weight of a mallet is between 2 pounds 10 ounces to 3 pounds 4 ounces while carbon fiber mallets tend be the lightest. Length – The length of the shaft that is right for you will depend on your style and stance. Shaft shape – Many players tend to like octagonal or hexagonal shafts instead of round ones which will help them hold the mallet at a consistent angle. Rigidity of shaft – If you have a rigid shaft, you will usually have better control, specifically for stop shots. Peripheral weighting – If you have lead weights on the sides of the head or a shape that puts most of the material on the sides, you will have a mallet that swings in a straight line. Size of head – Mallets with a large cross-section are usually preferred by beginners since this reduces the chance of hitting mallet’s edge while smaller cross-section mallets are preferred by more experienced players. Shape of head – Most of the modern mallets have a square head instead of a round one. Materials used – You will find that cheap mallets are usually made with wood and the more technically advanced mallets use carbon fiber or metal. The next important part of the best croquet set is the balls. Available in a variety of colors, the balls usually come in orange, green, yellow, black, red, or blue colors and will correspond to the mallet you are using. This can be helpful to those players who get distracted when playing as well as the custom of croquet play. You use the same ball that you start with throughout the game. But in some variations, you may use more than one ball at a time. Varying in weight, the ball can depend on the type of game you are playing. Serious matches will need a regulation ball weighing sixteen ounces while informal games can just adjust to your needs. This can be a great way for older and younger players who don’t have the same strength as the other players so you can always look for balls made of plastic or other materials. Although wooden balls are no longer available making the balls you do purchase more durable. Next in the croquet set are the stakes. These are the actual target you are aiming for as you play, and they normally have the colors of the balls on them which indicate that you are to hit them with your ball. After hitting every stake and zigzagging through the wickets, you have won the game. Make sure to buy stakes that are sturdy and can take a beating. One of the last parts of a croquet set to consider are the wickets. You will have the most wickets out of all of the components as they need to be set up all over the yard. Since you have to navigate through them in a specific direction to win the game. It is necessary for you to have sturdy wickets since it is more than likely that they will be hit by both balls and mallets. In some cases, a ball can hit a wicket so hard it can move it if it made with a poor quality. You also want a wicket that will keep its shape after being hammered into the ground. Wickets can be made of plastic, wood, steel, or wired hoops. The least expensive wickets are the wired hoops but they also tend to be the least sturdy over a long period of time. Wood, plastic, or steel are good choices that are long-lasting. 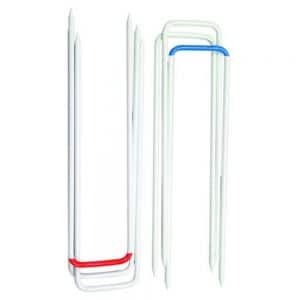 There are also adds on that can help make your game a little better including corner pegs and boundary string. Boundary string consists of construction nylon that you can purchase in 500-foot spools in either fluorescent pink or white yellow. Corner pegs are either made of narrow board or dowel and can be painted yellow, black, red, or blue. You can even add flags in these colors making your game look very official. Add some bright, colored wicket clips in each of the colors of your balls to help remind you where you and the other players are on the court. For those that are very serious, you may want to use the Carryover Deadness Challenging Optional Rule that requires a Deadness board that can be pretty expensive. They can also be hard to make but you can use colored markers a dry erase board effectively. 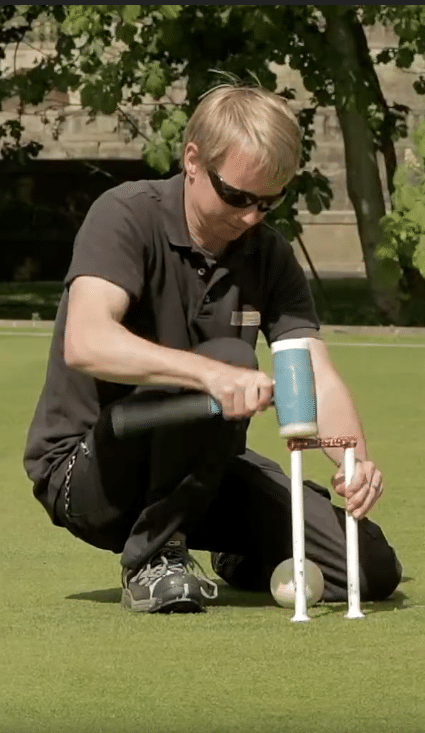 One of the best parts of croquet is that you can play it on a variety of surfaces. Since the surfaces are all different, this can affect how the game is played. 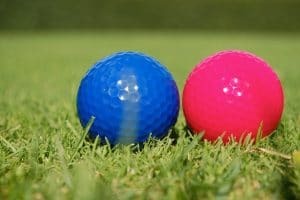 For examples, “golf croquet” is played on a surface that is similar to a golf green where the grass is short allowing the ball to move further and hit more accurately. Most games, however, are played in backyards so the game will depend entirely on the condition of your yard. It may have low or high grass which can have a large impact on how the game will play out. Accurate players can have less ball control than when they play on high or less well-kept lawns. You can also play on an artificial surface which is becoming a more common trend for those living in weather that varies a lot or where the weather is cold or it is hard to keep grass maintained. Croquet is similar to bocce ball and is a great pastime for seniors making artificial turf a good choice. The grass is then uniform and allows for the ball to be hit more accurately and struck harder. With artificial turf, the game can also be played indoors. Clay is also a surface that croquet can be played on giving you a uniform surface that allows the ball to be hit farther although it won’t go as far as it would if it was on grass. You can vary your game of croquet depending on the number of players you have. Most commonly you will see the game played with either four or six players. You will also find most sets in either a four or six player configuration. If you think you will ever have six players, it’s a good idea to get that six players set instead of getting the four-ball set and then buying extra mallets and balls later. If you do go for the four-ball set, you can certainly play a format where you rotate players in and out to keep the game fresh and allow everyone playing time. When you do want to purchase your set a la carte, you can find stores that have a good choice of sets and accessories that will let you add on as you go. This can be more expensive than just purchasing a complete set. But it will let you get the pieces that you want when you need them. This can also be helpful if you have an older set that you may want to add a couple of mallets or balls to upgrade. Surprisingly, there is quite a difference between the informal and formal versions of croquet. Formal versions let a player only use their own mallets while informal versions allow you to trade out your mallet. Informal games also allow the players to decide on the rules. All rules are pretty much negotiable and can be changed at any time in the game. This often happens when there is a dispute where the players will then make a decision by voting on the decision. Formal croquet requires players to follow a set of decorum and rules that cannot be changed. A game that has several purposes and uses. Croquet can be enjoyed by seasoned players as well as kids and beginners. This is a great game for the backyard. You can drink a cold beer and spend time with friends and family. It even gives you a great way to exercise and spend time outside during the summer. So it’s a great investment for anyone, even if you don’t enjoy anything athletic.